As education leaders, at times it can feel like we’re saying the same thing, over and over again, with little effect. Effective leadership means communicating many messages—such as getting people to believe in the work we do, take action, support change, and stick with it until a job is completed. Humorous and entertaining, this video demonstrates the importance of creating value for our mission—and the need to surround ourselves with those who believe in the work we are doing! This is a wonderful video to show when rolling out a new project or initiative and when the need to get buy-in from others is important. In this fun, animated video, leadership guru Ken Blanchard recounts his unusual experience visiting the DMV and shows how one leader transformed this dreaded destination from a place of toxicity and inefficiency to one of positivity and efficiency. A powerful video to show when embarking on a school improvement/turnaround plan, especially one that involves staff working to improve the school they’ve been at for a long time. 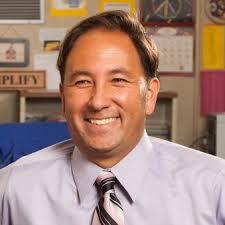 Alex Kajitani is the 2009 California Teacher of the Year, and the author of Owning It, named “Recommended Reading” by the U.S. Department of Education. He speaks across the country to teachers and students on motivation and leadership.